St. Germain is like the Samuel L. Jackson of liqueurs – it’s in everything these days. If you haven’t tasted it (or you’re militantly hetero and won’t admit to tasting it) it’s an Elderflower liqueur – sweet, floral and quite refreshing. Last weekend I was making butter recipes from the cookbook Fat: An Appreciation of a Misunderstood Ingredient, with Recipes. One of those recipes was for a rum butter, but I didn’t have any decent rum in the liquor cabinet. So instead, I decided to combine butter with just a splash of St. Germain – the result was unexpectedly good. So here’s the “recipe”, although it couldn’t get much simpler. 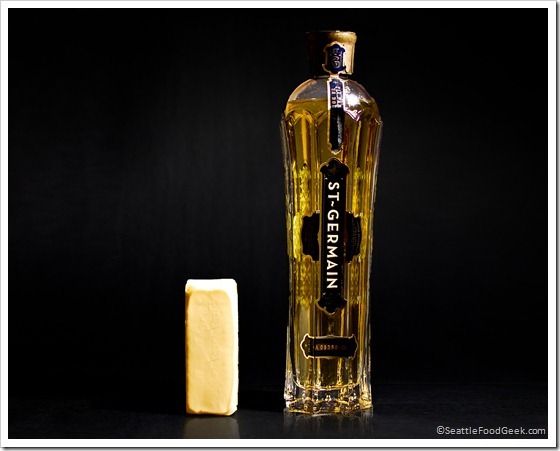 Combine the butter and St. Germain in a small bowl using the back of a fork. Add salt and stir to combine. Add additional salt, to taste, if necessary. So, next time you’re putting bread and butter on the table, consider making the party a little more interesting by getting your butter liquored up. Your mouth will thank you. If you haven’t noticed, flavored salts are becoming wildly popular. On a recent trip to Whole Foods, I spotted an aisle-end display with no fewer than a dozen varieties: some infused with spices, some mined or harvested from exotic locales, and some smoked. Smoked salts – salts that have taken on the flavor of a particular burnt wood – are an excellent way to add a deep, campfire flavor to dishes. I use them all the time in dry rubs, and as a substitute for the flavor you get from actually cooking over wood. In this video I’m using hickory chips, but another popular option is to flavor your salt with by smoking the wood from old wine barrels. Needless to say, you’ll save a ton of cash on specialty salts, which, of course, you’ll need to import all those ancient wine barrels from Bordeaux!